The title of the present post really ought to be “Tracking Dr. Fraas”—or perhaps “Fracking Dr. Fraas” for the alliteration?—for, as I explained in part 1, it turns out that “the famous paleontologist Dr. Traas,” who reportedly claimed, “The idea that mankind is descended from any Simian species whatever, is certainly the most foolish ever put forth by man writing on the history of man. It should be handed down to posterity as a new edition of the Memorial on Human Follies. No proof of this baroque theory can be given from discovered fossils,” is in fact the famous paleontologist Dr. Fraas. T. T. Martin’s Hell and the High Schools (1923), William A. Williams’s The Evolution of Man Scientifically Disproved (1925), and William Bell Riley’s Inspiration or Evolution (1926) all get the surname wrong, probably as a result of a mistake in Luther Townsend’s “Scientific Opinion Opposed to Evolution” (1917), while Theodore Graebner’s Evolution: An Investigation and a Criticism (1921) gets it right. Still, who is Dr. Fraas? The easiest way to answer is to look at Dieu et Science (1910), by Elie de Cyon (1843–1912), which introduced the quotation to the American creationist scene via a column in the Literary Digest in 1911. Besides characterizing the passage as the insight of a shrewd paleontologist, Herr Fraas, von Baer isn’t particularly helpful, providing no first name and no reference for the passage. But having the German version in hand was helpful, because I was then able to find, in Franz Heinrich Reusch’s Bibel und Natur (1876), a version of the quotation, with two further sentences: “Lassen wir darum beruhigt den Gorilla in den tropischen Sümpfen von Gabon-Gina, dem einzigen Orte des Planeten, wo man ihn trifft. Den Beweis seiner Blutsverwandtschaft mit diesen Ungethüm bleibt vor der Hand der Mensch sich noch schuldig.” In the 1886 English translation: “We may therefore calmly leave the gorilla in the tropical swamps of Lower Guinea, the only place on this planet where he is found. The proof of man’s relationship to this monster has still to be discovered.” (I was disappointed to find that my off-the-cuff translation, on which Fraas was recommending that we reassure the gorilla that the proof of its relationship to the monstrous humans is yet to be discovered, was wrong: it would have been funny.) Plus Reusch even provides a first name for Herr Fraas, Oscar, and a source for the quotation, Vor der Sündfluth! 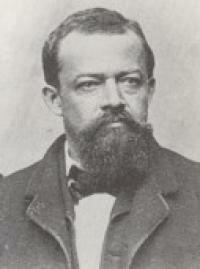 Oscar Fraas (above; 1824–1897) studied theology at the University of Tübingen and served as a pastor for four years in southern Germany. But he was also keenly interested in the natural sciences, and obtained his doctorate from the University of Würzburg in 1851, becoming the curator of the department of mineralogy and paleontology at the Royal Württemberg museum of natural history in Stuttgart in 1854. According to the obituary in the Geological Magazine, he “not only made the Stuttgart collection one of the finest in Europe, and enriched it with Swabian fossil batrachians, reptiles, and mammals, many of which are absolutely unique; he also published popular writings to interest the people in his work, and carried on a long series of researches, of which the result appear in more than sixty papers and memoirs.” Among those popular writings was Vor der Sündfluth! (1866)—Before the Deluge!—which, according to M. J. S. Rudwick’s Scenes from Deep Time (1995), was a German equivalent of the hugely popular La Terre Avant le Déluge (1863)—Earth Before the Deluge—by Louis Figuier (1819–1894): “it was the success of Figuier’s book in France that prompted Fraas to write a similar work.” More to come in part 3.